As natural hoof care has risen from obscurity to a well respected method of equine hoof care, there has also arisen a huge need for "specialists" in the field of rehabilitative natural hoof care. The course is attended by veterinarians who wish to add this skill set to their current hoof care practices. A Podiotherapist's skills go deeper than just surface maintenance trimming, and they are therefore able to offer specialist rehabilitation strategies based on combining scientific research and natural hoof care practices. An Equine Podiotherapist is also trained in the role of the hoof as it relates to equine biomechanics and and the musculo-skeletal system. They understand how hoof issues influence the entire horse, creating secondary musculo-skeletal issues and gait problems. They are, in fact, a "hoof therapist" in every sense of the term. Course Background: Who developed the course? Due to the huge demand for specialist training in this new career path, and the lack of professional training available worldwide, the Australian College of Equine Podiotherapy was developed by leaders in this new field. A private college dedicated to educating professional hoof care providers, farriers, and veterinarians. Since 2008 the college has offered two courses per year in the Diploma of Equine Podiotherapy. The college aims are to promote science based natural hoof care as a form of rehabilitation for serious hoof issues and to help horse owners have access to trained professionals so they are able to make better choices for the ongoing hoof protection and continued soundness of their equines. Lecturers (go to Lecturers page for detailed information) for each subject are sourced from professionals who are already working in this field. Veterinarians, Equine Myofunctional Therapists, Biologists, Natural Horse Educators, Master Farriers & Equine Biomechanical specialists for the equine subjects, plus professionals from the corporate world who can offer insights into successful small business operation. Much much more than you expect!! See our curriculum for full details. Why should YOU consider a Diploma of Equine Podiotherapy with the ACEP? Rehabilitation through hoof trimming is much more than just removing hoof material and hoping to end up with something akin to a wild horse style hoof form. 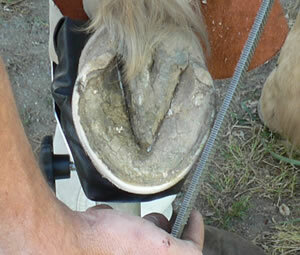 As a professional you will encounter a great number of hoof problems, some of them life threatening. You must have a deep understanding of the reasons for the varied hoof conditions you will come across or you are just part of the problem! Your choices as to the type of trimming you apply to each individual horse may make the difference between a successful rehabilitation and failure! Choose a course that leaves you confident that you are able to handle anything that comes your way. Choose the course that veterinarians are also choosing! Equine Podiotherapy. Natural trainer Wayne Anderson, previously a Master Farrier, now a professional trimmer, shows students stress free foal handling techniques.